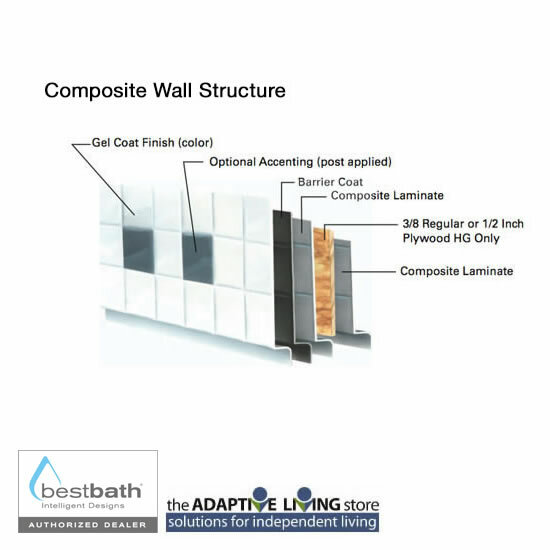 Recessed panels for inlaid tile accents, 4 piece shower with 4" smooth tile wall finish, beveled 1/2" threshold, integral wall shelves and center drain. 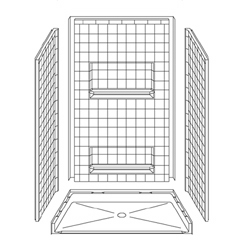 Bestbath Designer Series four piece 48" x 34" barrier free shower provides easy walk-in or roll-in shower access. The strong, luxurious polyester gelcoat composite fiberglass shower with "Four Inch" tile look finish is built with full plywood backing on all walls for outstanding strength and customized installation of accessories. The self-supporting pre-leveled bottom eliminates mud setting. Easy, snap-in-place installation from the front. No grout cleaning and easy care finish.